At the end of the 19th century, Boston had a lot to be proud of. Many considered the city a modern day Athens — rich with art and culture, Brahmin wealth and elegant houses. But there was a darker side to Victorian Boston: crowded slums, widespread poverty, hunger and a shockingly high rate of infant mortality. Back then, there were only a handful of charity hospitals to serve Boston's poorest children and their families. But in 1894, a group of Bostonians, led by a Congregational minister named Rufus Tobey, commissioned a barge to create a floating hospital. 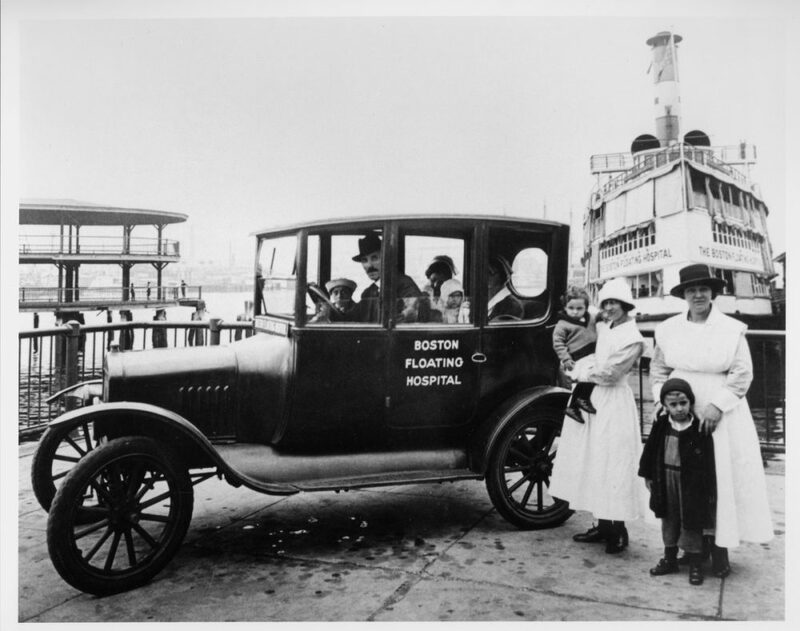 Today, the Floating Hospital for Children is part of Tufts Medical Center, although it's no longer floating in Boston Harbor. Dr. John Kulig: “If you were well-to-do, you saw a private doctor. Hospitals were avoided at all costs because they were places where one acquired infection. Infant mortality spiked four to five times the baseline rate every summer because of cholera infantum, which was a disorder of diarrhea and dehydration, largely due to contaminated milk, water and poor conditions...There was very little science involved and, in fact, the infant's hospital in Boston closed every summer because they had so little to offer to these children." JK: “The hospitals that did admit children were run by boards of directors that felt that parents should be excluded because they were part of the problem, and that it was their job to educate the children in hygiene and morality. And so the education piece really was missing from the traditional hospital setting at the time." JK: “Regrettably, in 1927, on June 1, just before the beginning of the season, the hospital ship burned to the ground — or to the water level. This was an accidental fire. And the board initially was very bent upon replacing the ship immediately, but then really thought better of it and decided that a land-based facility was really the best way to go." Dr. John Kulig, director of adolescent medicine and pediatrician at the Floating Hospital for Children at Tufts Medical Center. He's also professor at Tufts University's School of Medicine and he was instrumental in spearheading the writing of the new book, "The Boston Floating Hospital: How A Boston Harbor Barge Changed the Course of Pediatric Medicine." The impact of science on the practice of medicine was negligible as the nineteenth century ended. There were very few laboratories to investigate the causes for pediatric diseases, to search for cures, or to study tissue samples or cultures from sick children. The medical tools and resources of the time consisted of primitive or dangerous medications whose side effects were not well understood. For these reasons, the therapies most often recommended involved fresh air and sunshine, and these natural remedies remained commonly used weapons in the treatment of disease until well into the twentieth century. While American medicine was slow to accept the germ theory, by the 1880s it was generally accepted that bacteria in milk was responsible for intestinal diseases of children. Most doctors advocated for the wider availability of pure milk for infants. Unable to do much for their patients, doctors concentrated on adjusting what infants were fed and finding foods they could digest. Indeed, pediatricians were popularly referred to as "baby feeders." It was debilitating poverty, prejudices against the poor, and insufficient knowledge of children's medicine that provided the backdrop for the inception and execution of an idea that would change how poor children were treated by physicians, ultimately revolutionizing how the medical community viewed pediatrics overall. The origins of the Floating were simple and modest. Its founders wanted a practical solution to a pervasive problem: poor children were dying by the hundreds during the summer from intestinal diseases that were rampant in the crowded slums. The doctors of that time were only beginning to forge weapons against these intestinal illnesses, but they knew that if children could get into the fresh air, way away from their environment, if they could be given good food and compassionate medical care, they would have a better chance to recover. Of these three prescriptions, the most readily available was fresh air, but for a variety of reasons it was often difficult for poor parents to take advantage of this simple directive. It was not a doctor but a Congregational minister who had the imagination and vision to understand that a healthy atmosphere and medical care could be combined on a hospital boat that could venture out onto the water and expose its passengers to cool breezes and sea air. On board, as far from the city and its squalor as possible, a staff of doctors and nurses would see to their patients' medical needs. Luckily, in addition to his vision, this man possessed the determination that made his dream come true. In just a few years, a small barge developed into a pediatric hospital ship internationally known for its success in treating childhood diseases and its research facilities. In time, it far surpassed the modest aspirations of its founders as it developed into an important land-based pediatric teaching hospital as well. This segment aired on October 1, 2014.